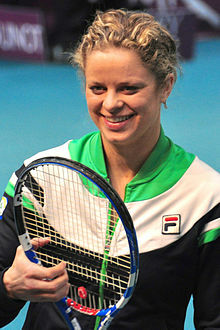 Kim Clijsters (Flemish pronunciation: [kɪm ˈklɛistərs] ( listen); born 8 June 1983)is a Belgian retired tennis player. She used to be ranked as the World No. 1. On 22 August 2011 she was ranked third in the world. ↑ "Career Prize Money Leaders" (PDF). WTA. 2016-08-29. Archived from the original (PDF) on 12 June 2016. Retrieved 2016-09-04. ↑ "Kim Clijsters". espn.co.uk. Retrieved 12 September 2011. ↑ "Sony Ericsson WTA Tour Singles Rankings". This page was last changed on 13 January 2018, at 03:23.